January 3, The Iran Project – Iran has taken part in the first international exhibition of China’s tourism industry which was opened in Haiku on Tuesday. Speaking at the opening ceremony of the exhibition, Mayor of Haiku appreciated all countries taking part in the fair, saying holding such exhibitions is a significant step in the development of tourism relations between China and other countries in the world. He also stressed on the role of such cultural event on introducing tourist attractions to visitors from different countries. 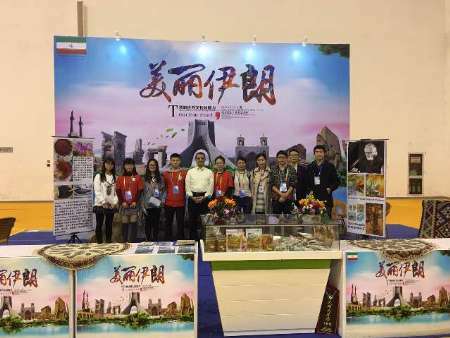 Iran’s Tourism and Automobile Association in close cooperation with Cultural Heritage and Tourism Organization have set up Iran’s booth in the first international exhibition of China’s tourism industry, planning to distribute cultural objects to make exhibitors and visitors familiar with Iran’s tourism features. Although Iran and china have extensive trade relations, Chinese people are not familiar with the country’s tourist attractions, so the presence of Iranian organizations in such exhibitions could be very useful for expanding the country’s tourism industry. More than 20 countries and a number of tourism agencies and organizations are participating in the three-day international exhibition. In a meeting held in June, head of the National Library of Iran and Chinese minister of culture in Beijing highlighted the need for the two countries to boost cultural ties to a strategic level, saying they could achieve this end by holding joint exhibitions such as Silk Road special expo, holding cultural weeks and specialized sessions between the two side’s academic elites.